FUE Hair Transplant – What are the Steps? FUE hair transplant is a revolutionary procedure that can help you get rid of baldness. It is a hair transplant procedure that is very popular these days. FUE basically stands for Follicular unit extraction surgery. This is a very advanced and modern method which is highly efficient. 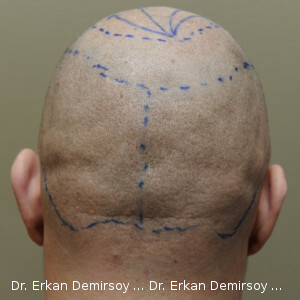 No other hair transplant method or procedure can be compared to FUE. An FUE hair transplant is a permanent solution to your balding problem. Let’s discuss some of the steps of this procedure and learn more about it. The first thing that you need to do is send your photos via our online-consultation form. The doctor will analyze your problem and then provide a solution accordingly. Some people might have male pattern baldness while others might have different issues. So the type and nature of surgery may differ depending on the patient. Once the doctor has analyzed your scalp we will explain you the complete surgery procedure and send you a quotation. In the next phase of a FUE hair transplant the doctor will have the hair at the back of your head trimmed so that the hair follicles can be extracted with ease. It is important to trim the hair for the surgical procedure to be performed. This is a fairly simple part of the overall process. Next up the doctor will give you some local anesthesia to make sure that the entire FUE transplant procedure is almost pain free. Then the doctor will proceed to remove the donor tissue from the back of your head. You shouldn’t feel any pain as the anesthesia will take effect. Donor area after one year. Based on the number of Follicular Units (FU) the patient requires, each FU is selected and removed one by one using sharp, 0.7 to 0.8 mm micro-punches. Once the selected FU is separated from the surrounding tissues it can then be extracted by a forceps gripping the hair above the surface. The small hole left behind after the follicle is extracted heals over the next few days. The wound contracts as it heals, making the resulting round scar so small as to be virtually unnoticeable. In the next step of the FUE surgery grafts are counted and prepared so that they can be transplanted in the balding areas. Once the hair tissue is ready the balding area is prepared for the transplant. Anesthesia will again be used to ensure that the patient doesn’t suffer any pain. The hair at the top of the head does not need to be trimmed or shaved for the procedure to take place. The doctor will proceed and make incisions in the balding areas. The grafts will then be placed carefully into these small incisions. The incisions should heal quickly and you can proceed with your normal life again.